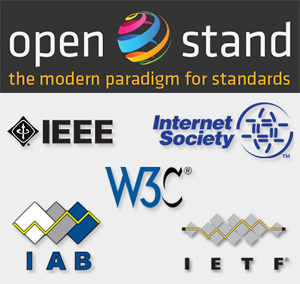 IEEE, IAB, IETF, Internet Society & W3C Invite Other Standards Organizations, Governments and Companies to Support Modern Paradigm for Global, Open StandardsFive leading group of global organizations — IEEE, Internet Architecture Board (IAB), Internet Engineering Task Force (IETF), Internet Society and World Wide Web Consortium (W3C) — today announced that they have signed a statement affirming the importance of a jointly developed set of principles establishing a modern paradigm for global, open standards. The group have invited other standards organizations, governments, corporations and technology innovators globally to endorse the principles. Leslie Daigle, chief Internet technology officer with the Internet Society says: "International standards development for borderless economics is not ad hoc; rather, it has a paradigm — one that has demonstrated agility and is driven by technical merit. The OpenStand principles convey the power of bottom-up collaboration in harnessing global creativity and expertise to the standards of any technology space that will underpin the modern economy moving forward." Local Time: Saturday, April 20, 2019 12:05 AM PDT – Page Load: 0.2666 Sec.